What's Important to Today's CMOS? For the first time in three years of taking this survey, research shows that the predominant driver for CMOs is marketing ROI. In a 2010 trends and buzzword study by Anderson Analytics, 530 of 1800+ active MENG (Marketing Executives Networking Group) members across the US participated by responding to an extensive survey. Bear in mind that these are marketing executives who have made $160,000 (excluding bonuses, options etc.) or more at one point in their marketing careers. They are interviewed by select members of the group before they are granted membership. Key among the findings was a three year summary chart showing the most important marketing concepts based on survey respondents. Here is a quote summarizing the chart. 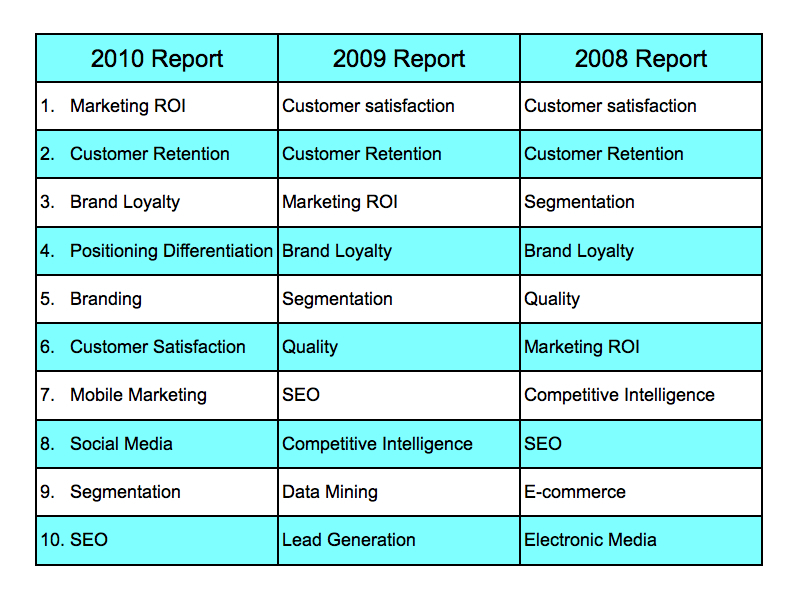 This chart shows the top ten strategic focal points that evolved over a three year period for these marketers. No doubt the tight economy promotes the idea that all advertising dollars must be accountable. Even trends like Social Media must now withstand the ROI test in order to earn the credibility of both marketing and operational executives. How would you interpret this chart. All of us who read this blog would appreciate your thoughts. Posted on October 18, 2010 by Ted Grigg and filed under Direct Marketing Strategy, General.